Last issue I reviewed an excellent collection of psychedelic tunes by Canadian guitarist Gerry Alvarez. Alvarez was a founding member of the seminal 80’s garage rock band The Gruesomes. The Gruesomes came along at a time when the airwaves were saturated with electropop like Madonna and bland alt-rock like REM. It was all safe, mainstream mush for the masses. But these crazy teenagers who called themselves the Gruesomes (named after the creepy neighbours of the Flintstones) sported ridiculously long mop-tops and played raw music with a snarl and lots of attitude. It was a breath of fresh air for young Canadian music fans like myself who were sick to death of the stew of mush that the radio stations were feeding us. I remember coming home with my newly purchased copy of Tyrants of Teen Trash and giving it a spin on my turntable. Raw, crunching guitars, 60’s style garage rock melodies, and Bobby Beaton’s snotty vocals assaulted my ears and put a big smile on my face. Unlike the punk underground (which even then was well past its heyday), The Gruesomes weren’t concerned with politics or anarchy. They had the punk attitude, but their concerns were the stuff of classic teen anthems: partying, girls, surfing, hotrods, and sticking to it your parents. 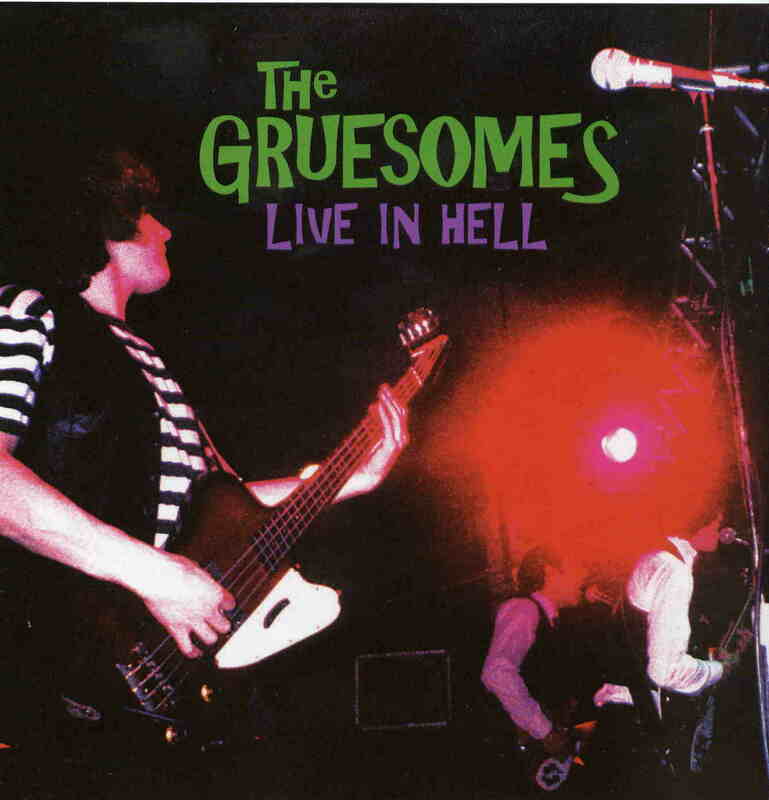 The Gruesomes’ live shows became legendary, known as much for their wild antics as for their music. The band played sell out concerts across Canada in the 80’s. The Gruesomes Live In Hell is a document of one of those shows, from The Pub Flamingo in Halifax, Nova Scotia, 1989. The line up for this set featured John Knoll on drums (who had replaced original drummer Eric Davis in 1987), as well as Bobby Beaton, Gerry Alvarez, and John Davis. And while you may not be able to see the stage antics, you can still hear the raw energy as the band rips their way through classics like The Theme From Bikers From Hell and My Dad’s a Ho-Dad, as well as their hits like Way Down Below and Hey! (I use the word “hits” in a relative sense, because mainstream radio avoided The Gruesomes like the plague even though they were one of the country’s most popular touring bands). The sound quality isn’t always top notch, a little wobbly at times, but what do you expect, this is garage rock, man! This one took me back, but you don’t have to have been a fan to enjoy it. The sheer youthful exuberance and raw energy is infectious as the band rocks through twenty-three great songs that fans of 60’s bands like The 13th Floor Elevators and The Seeds will love. 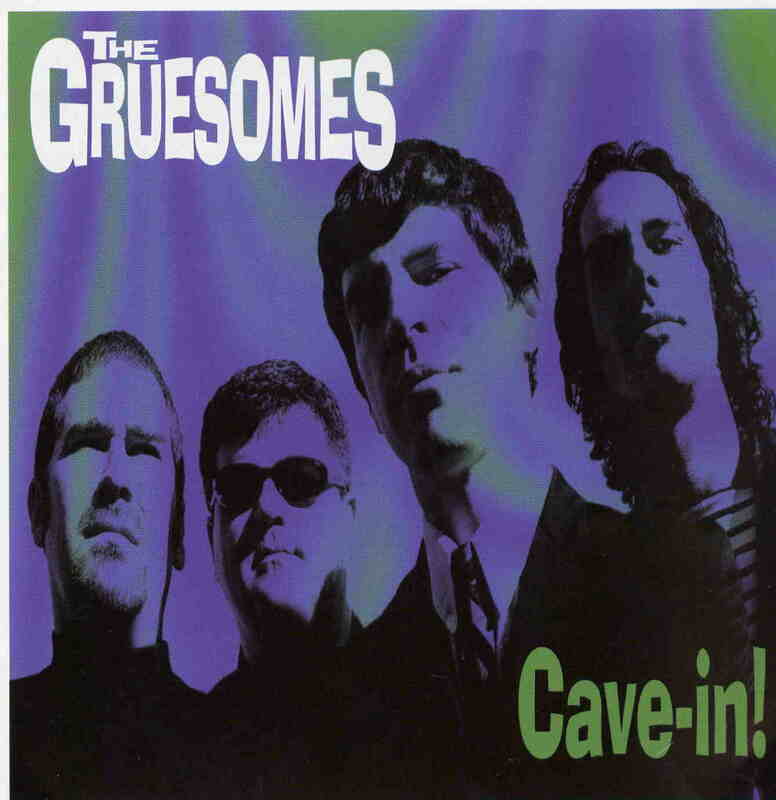 The Gruesomes broke up in 1990, but 10 years later the latter day line-up (the one from the live disc) reformed and recorded a brand new album called Cave-in!, but unfortunately, it didn’t see a very wide release. Well, 7 years later in 2007, The Gruesomes are still together and still rocking hard, and it was decided that Cave-in! be given a proper re-release along with the Live In Hell CD. Cave-in! finds the band in top form as it kicks things off with the title track, a fuzzed-out psychedelic surf-rock instrumental. On the vocal tracks, Bobby Beaton’s voice isn’t quite as high and youthful as it used to be, but it still has that classic snarl. One thing that is different is that all the members of the band play their instruments a little better. They sound tighter and more accomplished than ever, but still know how to rock out with wild abandon on great tunes like the gloriously cheesy organ and harmonica drenched You’re Not the Boss of Me, the raunchy Come and See Me (I’m Your Man), and the frantically brief (1 ½ minutes!) Wish You Were Her. There’s also a bit more of a melodic R&B influence on tracks like You Gotta Believe Me and You Were Not Using Your Head. The band’s song writing skills have also improved, and it finds them a little more adventurous at times, like on the swirling, psychedelic anthem Hyp-no-tized. This is the sound of a band refreshed and revitalized after a 10-year break. They’re a little more mature, but still having a great time playing classic 60’s style rock without any pretensions. It may not sound quite as exciting as it did in the mid-80’s when it sounded like nothing else out there at the time, but it’s still pure Gruesomes, and still a pure joy to listen to.